Arkansaurus fridayi would have been slightly taller than a human and a very fast runner. Arkansaurus fridayi has been the state's official dinosaur for about a year. But it wasn't until very recently that scientists confirmed how unique our ornithomimosaur (ostrich-like dinosaur) really is. ReBecca Hunt, a paleontologist with the U.S. Bureau of Land Management in Moab, Utah, published a paper March 19 in the Journal of Vertebrate Paleontology identifying Arkansauras fridayi as a new species unique to Arkansas. It lived here during the Early Cretaceous period, about 113 million years ago, when much of what's now Texas was underwater and the shoreline was within 100 miles of southern Arkansas. 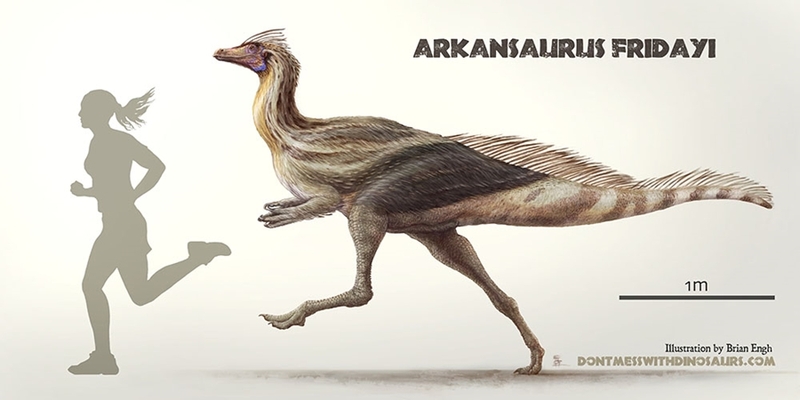 Arkansaurus is the second-oldest ornithomimosaur of its kind discovered in North America, the oldest being Nedcolbertia justinhofmanni, found in Utah in 1993. Like other ornithomimosaurs, it was bipedal, with long forearms, a long neck and feathers instead of scales. Its strong back legs and ostrich-like build would have made it a fast runner and a fearsome predator. Landowner Joe Friday discovered the fossilized remains of Arkansaurus, consisting of a nearly complete right foot, in a road construction pit dug on his Locksburg farm in 1972; hence the name "fridayi." The fossils were the first found in Arkansas. 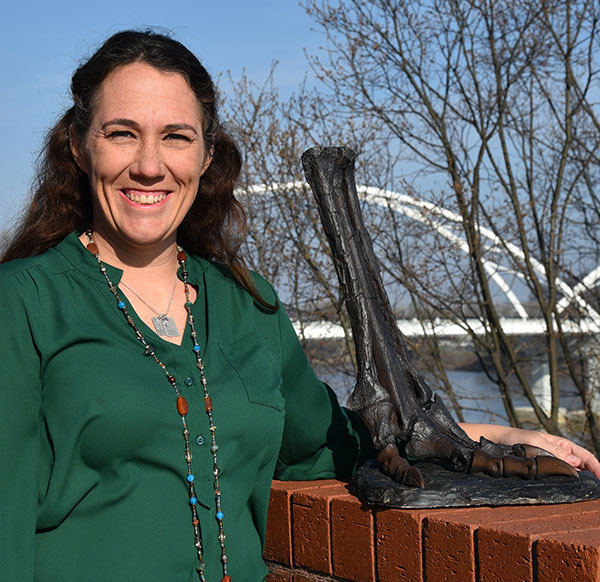 ReBecca Hunt with a cast of the dinosaur's foot. Evidence of dinosaurs is rare in Arkansas because the rocks fossils are found in are not well preserved here, Hunt said. They are also covered with thick layers of vegetation and soil. Hunt began studying the fossils in 2001 when she was a U of A undergraduate. "It's been a long, ongoing project," she said. When she finally did publish the findings, she honored the late James H. Quinn, former chair of what was then the of the U of A Geology Department, by naming him the second author on her Journal of Vertebrate Anthropology paper. Quinn, who died in a fall while collecting fossils in 1977, did the initial work to identify the fossils.